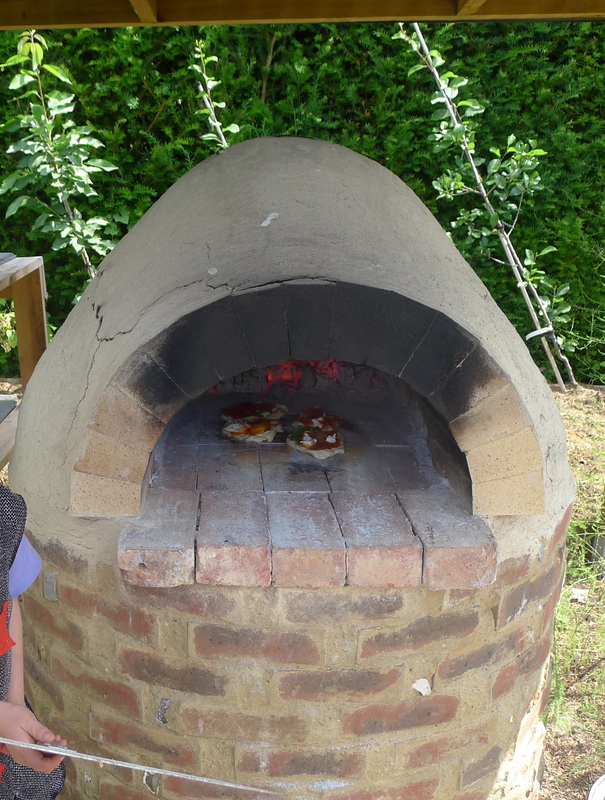 The clay oven has become one of the most important elements in our home (well, garden to be accurate). We are in the process of re-working the entire veg patch, where it lives, to fit better around it and its use. It has been a joy to cook in from the beginning, and although we are still very much learning its idiosyncrasies, we are getting some very good meals from it. Whilst I wouldn’t attempt a soufflé in it, most things that can be tackled in a conventional oven can be done in it. There are some things however, for which it positively shines. On clay oven days I wander out with my breakfast tea, and get the fire lit in its arched doorway. Once it’s burning nicely, the fire gets pushed back deep into the belly of the oven, and fed with logs. I partly close up the entrance with bricks, to help keep the heat in whilst allowing air to circulate. After a few hours the heat will be fierce, and have penetrated throughout the oven and into its floor. At that point, we are ready for pizzas (click here) and flatbreads. If we are pizza-ing, we keep a small fire lit inside the oven, pushed to one side, so that the high heat is maintained. If we are not making pizza (almost unheard of, but it can happen), then we scrape out the fire into a metal bucket, close up the door, and let the oven “soak” with the heat, so that becomes more even throughout the oven, and less fierce. Then we are ready to bake, wooden baking door snuggly in place. In addition to wonderful pizzas, it makes beautiful bread (even allowing for my inconsistent baking). The crust is perfect as the clay walls breathe in a way no ordinary oven can, as well as imparting a delicious, faint wood-smoke flavour. Once baking is done, the significant remaining heat is ideal for casseroles and stews, cooked in the lingering heat of the cooling oven, just as many traditional stews, such as the Lancashire hot-pot, would have been in times past. Vegetables and fruit can be wrapped and roasted last, and even some dishes, those for very slow cooking, left to reach perfection over-night. Even better still is that it is ideal not just for the summer, but for winter cook-outs too. It throws out a goodly amount of heat towards the front, even if the rest is well insulated. We can huddle near it happily wrapped up, and bathing our faces in the warmth, as we wait for breads and chicken legs, veg and ribs to be ready.